The year is 1929. You are Lil' Ragamuffin, the roughest toughest urchin in all of Garbagetown DC and the surrounding wastes of Montgomery County, but somehow the constabulary has managed to capture you and commit you to the city's highest security asylum. You don't aim to stay long. Guttersnipe: St. Hesper's Asylum for the Criminally Muschievous is a humorously grotesque (or grotesquely humorous) game about a street urchin and her pet sewer rat escaping a sanitarium full of tinctures, brines, and other misbegotten 1920s health remedies. 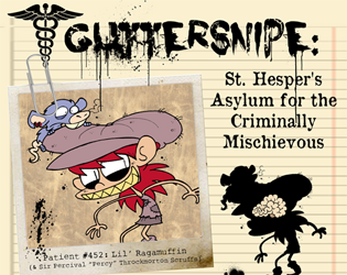 Special thanks to play testers Sarah Adams, Jake Strick, Capslock, Norman Rafferty, and Steph Cherrywell!Guttersnipe: St. Hesper's Asylum for the Criminally Mischievous is written in the Quest system and requires installed Quest software (available for free at http://textadventures.co.uk/quest) to run. Very fun games, can't wait to play the 3rd one.